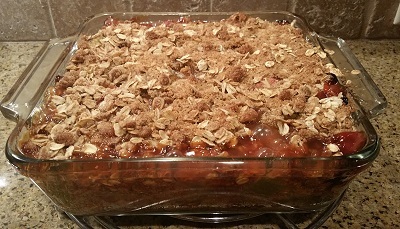 Rhubarb Crisp, similar to Rhubarb Crumble or the closely related Rhubarb Cobbler is my favorite of that group. It is the tastiest... and healthiest. It's mostly rhubarb and oats! And everyone loves it! Crisps, crumbles and cobblers are all shallow pans of fruit and some flour or grain thickener, with a sweetener. 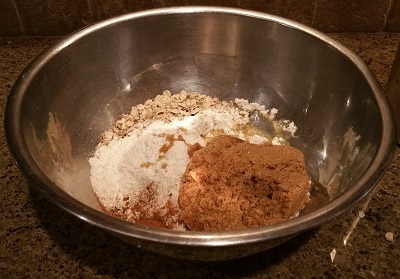 Some cobblers are made with the flour on top of the raw seasoned fruit and baked; while others mix the thickener and the sweetener with the fruit and heating it and then put the flour topping on last. 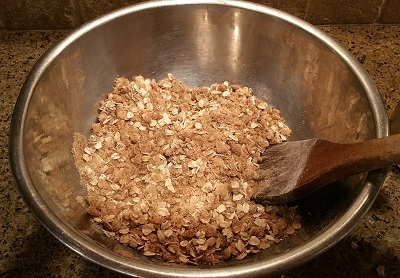 Crisp are usually uniform mixes of fruit and grains, usually oats. Here's how to make a great tasting rhubarb crisp, in easy steps, with photos to illustrate each step. If you want to make this gluten free, just substitute oat flour for the wheat flour, and arrowroot strach or potato starch for the corn starch. 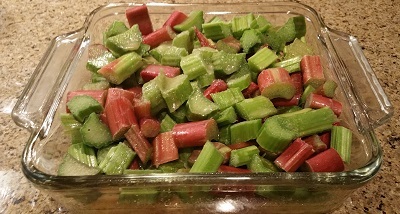 Rhubarb - 2 and 1/4 lbs of rinsed, rhubarb stalks. That's about 4 1/2 cups of chopped fresh rhubarb. 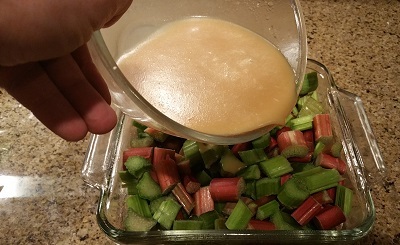 Rhubarb is a Spring to early summer crop, so other times of the year, you can substitute frozen rhubarb. 1 cup of flour - plain , all-purpose flour. 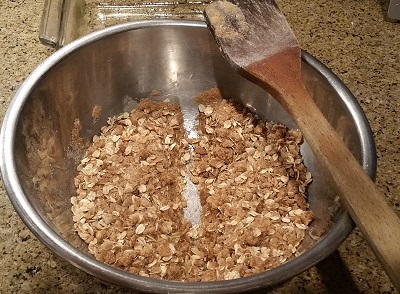 3/4 cup uncooked oats (like Quaker rolled oats) I think rolled works better than steel cut. 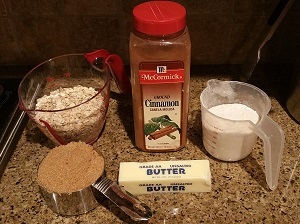 1 cup softened butter. Again, you may use a butter substitute, if that is your preference. 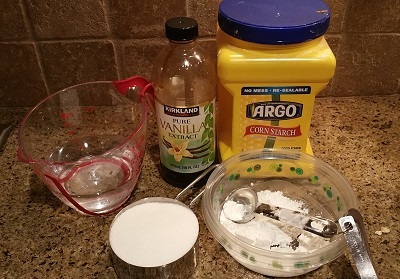 1 tablespoon vanilla extract. There's no doubt, real vanilla extract tastes better than imitation. Large mixing spoon, cutting knife, etc. 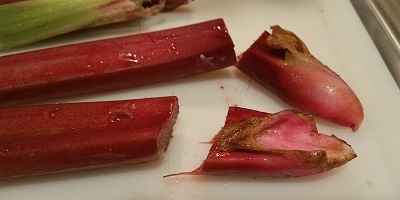 Just wash the rhubarb under cold water, using your fingers to rub the stalks, especially allong the inside channel where dirt typically sticks. Then chop into 1/2 to 1 inch pieces (1.5 cm to 2.5 cm). Be sure to cut off the bottom portion of the stalk that attaches to the plant - it's tough. See the photo at right. 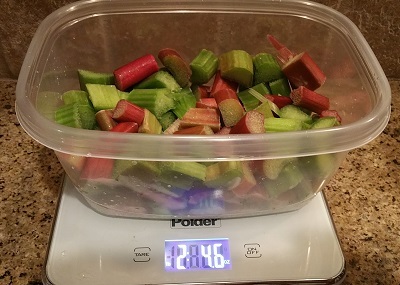 Two and a quarter pounds is about 4.5 cups of chopped rhubarb, so if you don't have a scale, just use a measuring cup. together in a mixing bowl. Just take your finger and about 1 tablespoon of butter, coconut oil, shortening, or spray coating to evenly coat the interior surfaces of the pan. 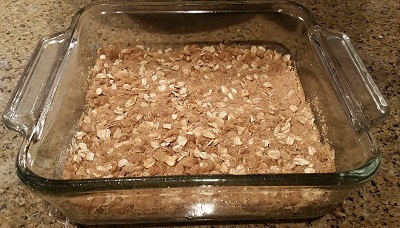 Put 1/2 of the crumb mix in the bottom of the greased pan and gently pat them down into place, with the back of a large spoon. 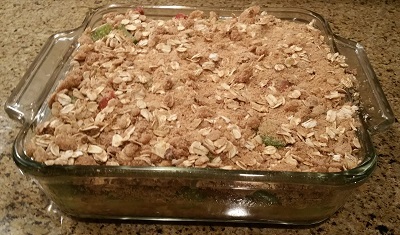 Put the chopped rhubarb in the pan on top of the first half of the crumbs. Evenly sprinkle the remaining crumbs over the rhubarb. Many people prefer it warm with iice cream on top. It will keep for a week in the fridge. If you don't ahve children, a spouse and you yourself have good self-control.